Most boaters – and every yacht broker – will recognize this scenario among their boating friends, family or browsing buyers: a couple spends the weekend onboard their boat or browsing for a boat to buy. One partner, usually male, is enthusiastic about the boat and eager to operate it, while the other, usually female, holds back, appears afraid and reluctant to handle the boat. Both the boat and its systems seem to overwhelm and intimidate her, and she may also question whether her partner is as knowledgeable as he claims. My vivid awareness of this situation arose when Arv and I helped our broker show our old Hatteras. For a young family’s second visit we took them for a sea trial. The husband loved the boat, wanted to buy it, but his wife was clearly terrified. Leanne McNally, now a yacht broker with South Coast Yachts in San Diego, sees this regularly. Noting how few women feel comfortable operating a boat, she decided to do something about it. While formerly managing Harbor Sailboats, a sailing club offering sailboat rental and training, she organized a series of seminars, called “Women on the Water,” teaching basic sailing skills designed to build women’s confidence and boating knowledge while enhancing their comfort level. “Men come (to boating) with an inherent confidence that women lack. While men arrive with the confidence to operate a boat and dock it, women want to know what the steps are and how to do things. I want to provide women with a place they can learn,” she said. Now, with the sponsorship of South Coast Yachts and use of their boats, McNally has revived the “Women on the Water” concept. Working with Capt. Debra Marks, they’re focusing now on both power and sailboats. 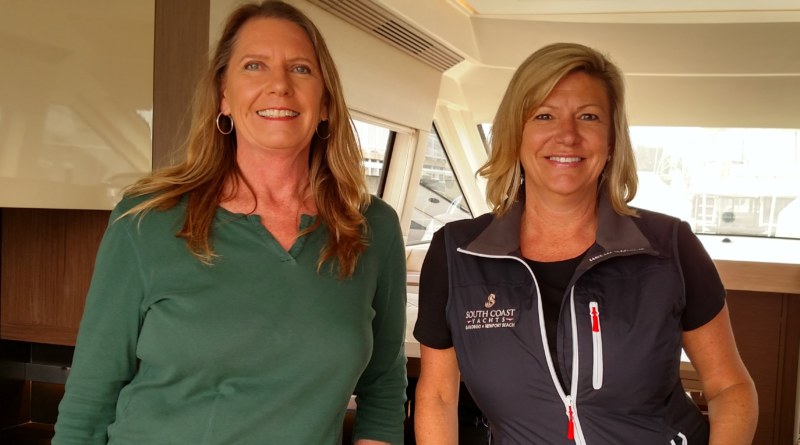 Their initial class, called “Safety Basics for Female Boaters,” debuts Saturday, July 8, running from 9-11:30 a.m. at Sunroad Resort Marina on Harbor Island, San Diego. Cost for the class is $40. In this first session they’ll concentrate on safety equipment and how to use it, particularly U.S. Coast Guard mandatory equipment, fire extinguishers, bilge pumps and marine radios. Depending upon students’ needs and requests, McNally and Marks will expand their classes to more subjects, such as line handling, navigation and use of electronics, and also offer them through South Coast’s Newport Beach location. Marks is well-qualified to teach introductory boating classes. A USCG-licensed captain for over 25 years, she has operated boats, both sail and power, from 22 to 164 feet all over the world, including a 49-passenger cruise ship, and currently captains a 120-foot yacht. Based in San Diego and travelling elsewhere as needed, she offers personalized yachting and boating instruction to novice boaters and owners seeking to improve their knowledge and skills. Often she’s hired by women eager to know how to operate their boat. “Women care about safety and are concerned their husbands don’t know how to deal with an emergency and they want to learn. Should something go wrong they want to know how to react and how to prevent a problem,” Marks explained. Marks became a captain by chance. After moving to the Los Angeles area from a land-locked part of Iowa, she found herself going out on boats with men who, she suspected, didn’t know what they were doing. From “self-preservation” she got training and eventually her master’s license, operating her first boat at 20 years old. Now holding a 500-ton license, she has taught owners of over 800 boats how to operate them. For enrollment or more information, contact McNally at South Coast Yachts at Leanne@scyachts.com or call 619-972-5153.